Taglines: Earth is a memory worth fighting for. A memorable sci-fi fantasy world with a human heart at its core. 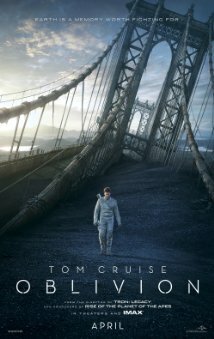 There are many ways to describe Oblivion, but the softly spoken afterword by Tom Cruise's character really makes you feel the human heartbeat of this sci-fi epic. The threads of the plot are well-woven and I won't give anything away, so what I will tell you is to prepare for a powerful journey into the unknown where nothing is what it seems. Explosive set pieces take a backseat for sci-fi philosophy with twists to spare. Oblivion ticks all the boxes for correct use of literary devices and establishes enough original cannon to stick in your mind long after the credits start rolling. It is a distinct success among the largely abysmal offerings of 2013 so far, don't miss it.